This combination is a real treat! 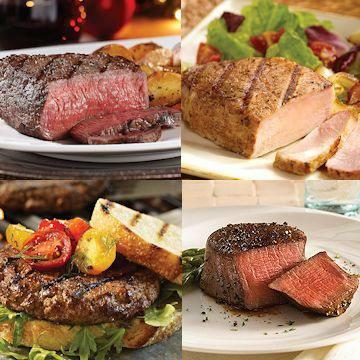 Beefy Top Sirloins, tender Filet Mignons, Steak burgers, juicy Boneless Pork Chops, appetizing Stuffed Baked Potatoes, and a delicious chocolate cake at a price that can't be beat. Order as many as you like at this special price and load up your freezer with unbeatable savings.